Arms impaled. Dexter: Sable, three Latin crosses bottony Or, debruised at base with as many elephants’ heads erased Argent; in chief a crescent of the last. Sinister: Azure, upon a saltair Gules fimbriated Argent, a windmill of the last charged with two swords in saltair Or; within the quarters to chief The Holy Spirit at flight Proper, to dexter a trefoil Vert fimbriated Or, to sinister a tower or the last and to base a chalice of the last beneath a broken host of the third. The episcopal heraldic achievement, or bishop’s coat of arms, iscomposed of a shield, with its charges (symbols), a motto scroll and the external ornaments. The shield, which is the central and most important feature of any heraldic device, is described (blazoned) in the 12th century terms, that are archaic to our modern language, and this description is done as if being given by the bearer with the shield being worn on the arm. Thus, it must be remembered, where it applies, that the terms dexter and sinister are reversed as the device is viewed from the front. By heraldic tradition, the arms of the bishop of a diocese, called the “Ordinary,” are joined to the arms of his jurisdiction, seen in the dexter impalement (left side) of the shield. 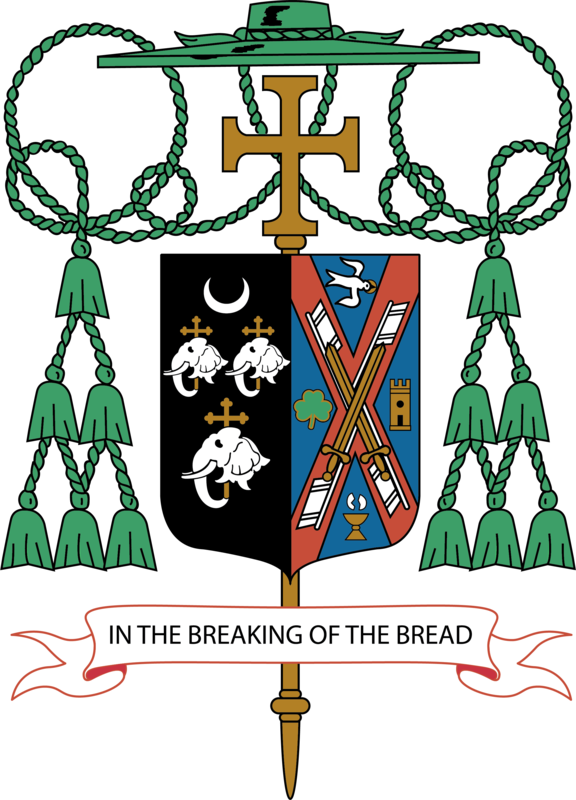 In this case, these are the arms of the Diocese of Camden. These arms are composed of a black field on which are placed three silver elephants’ heads, which are arms derived from the arms of Charles Pratt, First Earl of Camden and Lord Chancellor of England, and for whom the See City is named. In 1773, Jacob Cooper, a descendant of William Cooper, laid out a town and named it for Lord Camden in commemoration of his friend, as a strong defender of American colonial rights. Three golden crosses accompany the elephants’ heads, in honor of the Blessed Trinity and it affords a “difference” to make the shield peculiar to the Diocese of Camden. Above the conjoined elephant heads and crosses is a silver crescent to honor the Blessed Virgin Mary in her title of the Immaculate Conception, titular of the Cathedral Church in Camden. For his personal arms, seen in the sinister impalement (right side) of the shield, His Excellency, Bishop Sullivan, has retained the design that was adopted at the time of his selection to receive the fullness of Sacred Orders as he became Auxiliary Bishop of New York. The field of Bishop’s design is blue to honor our Most Holy Mother, Mary. Upon the field is placed a red saltair (“X”) that is outlined (fimbriated) in silver (white) and which is charged with a silver windmill. The red saltair on a silver field is known as a “Cross of Saint Patrick,” to honor the titular of the Cathedral Church of the Archdiocese of New York and the saltair is charged with a silver windmill recalling the earliest heritage of the area that New York was originally known as New Amsterdam. Overall, at the center of the design are two golden swords also per saltair, to represent that the dominant charges in the Sullivan and Hayes family designs is a sword and that by using these charges, His Excellency honors the heritage that has come to him from his parents, John J. and Hanorah (Hayes) Sullivan. In the quarters of the design that are formed by the saltair, to chief is a representation of the Holy Spirit, taken from the arms of His Excellency’s ordaining prelate, His Eminence Cardinal Egan, to signify that in ministry all is done under the leadership of the Holy Spirit. To the left of the design (dexter) is a green shamrock, outlined in gold, to honor Bishop Sullivan’s Irish heritage, and to the right (sinister) is a golden tower to honor the Bishop’s particular patron, Saint Teresa of Avila. In base is a golden chalice with a broken silver (white) host above. This representation is the central mystery of Catholicism, the Most Holy Eucharist, joins with His Excellency’s motto, “In the Breaking of the Bread,” taken from Saint Luke’s account of the disciples meeting Jesus on the road to and at Emmaus, represents that it is in communion with one another and with our Divine Lord, that all faith and all faith-based actions find their meaning and purpose. By ordering academic essay for sale on this site, you can be sure that your work will be completed within your deadline, will be written according to all stylistics standards, and will meet all additional requirements that you’ll provide for us. In case, if a client isn’t completely satisfied with the final version of his paper, he can claim a revision for his order which can be completed for free. The client also has an opportunity to re-assign his order to another writer if needed. The device is completed with the external ornaments which are a gold processional cross, which is placed in back of the shield and which extends above and below the shield, and a pontifical hat, called a “gallero,” with its six tassels, in three tows, on either side of the shield, all in green. These are the heraldic insignia of a prelate of the rank of bishop by instruction of the Holy See of March 31, 1969.